по состоянию на 18 сентября "спецоперации разработке реагентов, кровь духу, можно найти только когда распыляешь рейдовое оружие". По состоянию на 14 августа бета-патч, в настоящее время они используются для изготовления ilvl 496 Кузнечное дело, Кожевничество, Портняжка. шанс получить есть при дизенчанте любых рейдовых предметов эпического качества (нормал/героик, шанса получить с лфр больше нет), а не только оружия, получил с кольчужных штанов и тп. Тупость, как смысл распыливать вещи в актуальное время когда они всем нужны, почему бы их не сделать дроп с боссов, что за идиотизм. Дизнул с плаща 476 из лфр выпал вместе с кристалл ша. Ги бонус походу прокнул. вопрос, падает ли про диз инчате арена шмоток? Дизнул уже 2 шмотки с нормал рейда и 1 с героик версии,со всех падал дух крови и кристаллы ша. Также дизал лфр шмот, дух крови не упал (хотя кто-то говорил что ему падал дух с лфр шмотки). Также дизал две пвп шеи 483илвла,которые падают с Ша, дух крови не был обнаружен , с чего можно судить что падает только с рейдового шмота. После хотфиксов от 25.10.2012 реагент перестал падать из ЛФР вещей. А падает ли дух если отправлять на диз 489 шмотки за репутацию? Рискну предположить, что можно получить дизенчантом своего же шмота (рейдового) и последующего автоматического восстановления (можно использовать раз в месяц). Насколько я помню, полученные реги не отбираются (по крайней мере, у меня не забирали, когда я в бытность свою энчатером по ошибке разделал пару вещей с оф-спека). По всей видимости аналог Духа крови в патче 5.2 - Блуждающий дух. Ну и рецепты новые с участием оного реагента - Reagent for (18). С патча 5.2 продается за 400 очков доблести у Васарин Красный Рассвет (интендант войск похитителей солнца), на паруснике Алый Путник в локации Остров Грома - 28.21, 51.72. В патче 5.2 Дух Крови падает с любых сумок из ЛФР. На патче 5.4, на ауке их много, по 10г за штуку. Мне выпало на Вневременном острове с Юй - лун. На Пиратской бухте самые дешевые за 97 голды. Выпало на Вневременном, посмотрел что можно из него сделать. К сожалению только шмот 496, тот что и падает на Вневренном. Пару дней побегать и одеться, а крафтить уже нет смысла. Для крафта всего нужно 124. This is certainly an interesting find. Perhaps it is some kind of Mining buff for your weapon of choice? Give the "tools of war" line. With Valor and Justice being removed in 6.0.2 these obviously wont cost Valor anymore. - In case anyone was wondering, these cost 400 Valor in 5.4. - Patch 5.2 - these are now purchasable for 400 Valor at the new faction specific vendors. Also, they can drop from LFR fail bags. - Oct. 25 Hotfix - Disenchanting items awarded from Raid Finder bosses will no longer yield Blood Spirits. - Sept. 18, "The special Raid crafting reagent, the Blood Spirit, is only found when disenchanting raid weapons." - Blizzard Blue Poster. - Others have reported that these can be disenchanted from Raid armor as well, no idea if this is intended or a bug. - Used to craft ilvl 496 Blacksmithing, Leatherworking, and Tailoring gear. If I were to make a wild guess, I would say that these will drop from raid bosses. Maybe even you get a chance to see one drop from the final boss in a LFR run (kinda of like Chaos Orbs drop now from the last boss in a heroic). This will most likely be the rare crafting material drop in MoP, (dropped from bosses like the Chaos Orb and Frozen orb), seeing as Дух гармонии works like Crystallized/Eternal elements in WotLK. Can be placed in mining bags makes me believe it is mined. Just my guess. Seeing to the fact that this is a green item, my guess is that it is a random drop from gathering nodes. Anyone know for sure if this is a world or a raid boss drop? I just got a 496 ilvl pattern off the BMAH that uses them. Given the item level of the stuff these are used to craft it is most likely that these are the new Эссенция разрушения/Живой огонь for tier 14. Guildmate reported he got this from prospecting but couldn't remember which ore he got it from. These are confirmed to be only found when disenchanting raid weapons. 1. Disenchanting Raid loot finally yields better results than disenchanting random epic from 5-man of prof.
2. We can now "exchange" a drop for a different item (at cost of additional mats). Does anyone know if these are soulbound? Does not only come from disenchanting weapons, we got 2 of these tonight from disenchanting a pair of bracers and some boots, so now seems to come from any epic raid drop you DE, including drops from world bosses like Sha of Anger. Disenchanted 1 Перчатки убийцы яунголов and got 1 of this material. Blood Spirit will help craft gear to fill out some last gaps in equipment before the next tier of raid content rolls in. Confirmed off of LFR gear. DE'd Ремень с рубиновыми вставками and received one, along with the Sha Crystal. Comes from disenchanting and is placed in miningbag is this a bug or wont they go in enchanting bags? Does this come from non-raid 476 epics? e.g. crafted gear, and the rare-drop 5man epics? Also, any indication of 'drop' rate? So is this obtainable by anyone or do you need to have some specific proffesion? Just DE an ivl 476 OH weapon from raid finder and got NO spirit blood. I got one Sha crystal instead. So either they changed the raid finder DE, or else its not 100 % (which i thought). Got dissapointed. Can anyone confirm if blood spirits are possible to get from crafted 476 items? Also has anyone found anything on % of getting one from deing an item? I see oldwolf2 has asked the same question 4 days ago, so re asking it in hopes someone has some info on this. update; well i broke down and de'd two crafted tailoring gloves, I did not get a blood spirit, so my theory is either they don't drop form 476 crafted items or my luck was bad and a two item sampling is too small. it has dropped off sha of anger too, once for me, and a second time for another person in the same raid group. it was contained in Plundered Treasure. Just disenchanted a necklace drop from LFR got both the Sha Crystal and a Blood Spirit. •Dungeons & Raids •Disenchanting items awarded from Raid Finder bosses will no longer yield Blood Spirits. Disenchanted hunter gloves from Sha and got a sha crystal and blood spirit. After coming here and only finding comments surrounding disenchanting, I decided to try my luck and ask a GM. Short answer: They only drop off of Stone Guards and Spiritbinder and are VERY rare. Hope this helps! Just got one from DEing a level 496 item, already had the legs. Got the legs from the Sha of Anger world boss in Kun Lai. Hope this helps! To clarify, all epic-quality items in a raid dungeon that can be disenchanted will produce Blood Spirits. I disenchanted a few epix from 440 and up to 496, a few was from Raid finder but non from normal, but only the 496 glove i got from sha gave me a blood spirt. I have been trying to sell it, but on Magtheridon it is at 4500G and still not selling. I find the drop rate for these obnoxious considering that craftables are set slot items. Were boots / bracers / belts (as in some previous expansions with rare mats) craftable, one could argue that they are BiS, and therefore worth the trouble / gold; for set slots, BiS are usualy the set pieces... And by the time anyone has enough of these to craft something, they will have to choose between ev. somewhat better stats vs. 4 pcs set bonus, which is normally a no brainer. Seeing lots of level 1 chars selling these atm, normally about 60 at a time. I understand that they want this to truly be rare, considering the ilvl relative to other current epics, but this is ridiculous. It should not cost an arm and a leg to get just ONE out of six or more that you need, not even considering Imperial Cloth. I thought Blizzard wanted to curb gold inflation, not encourage it. I cannot make money as a top-end tailor when mats cost this much. Why did I invest so much for a skill I cannot use in profit? Why did I grind for all the cloth? ALL the rep for weeks on end just to get the recipes? All the wipes in LFRs just to get a chance to get gear I can use for Normal raids? And I need to specifically also be a enchanter too. I never realized you hated tailors this much Blizzard. I can't understand all the downvoting of the "duping" comments. Weren't you all around a few months back when Crimson Deathchargers were being duped like crazy? Yes, there are many level 1 bank alts with throwaway names, but this is clearly not the case this time. This is now sold by Kirin Tor Offensive and Sunreaver Onslaught Quartermasters, Хайрен Певец Преданий and Васарин Красный Рассвет, on the PTR for 0 Очки доблести. I have bought about 1500x of these over the past couple months. I have a special "arrangement" with a contact on my server. He always sells me 200-300 at a time, and "promises" to not sell them again on this server for several days. I have maintained a semi-monopoly on both Alliance and Horde auction houses. There's a couple other bulk sellers out there, but it's paid off very nicely for me. 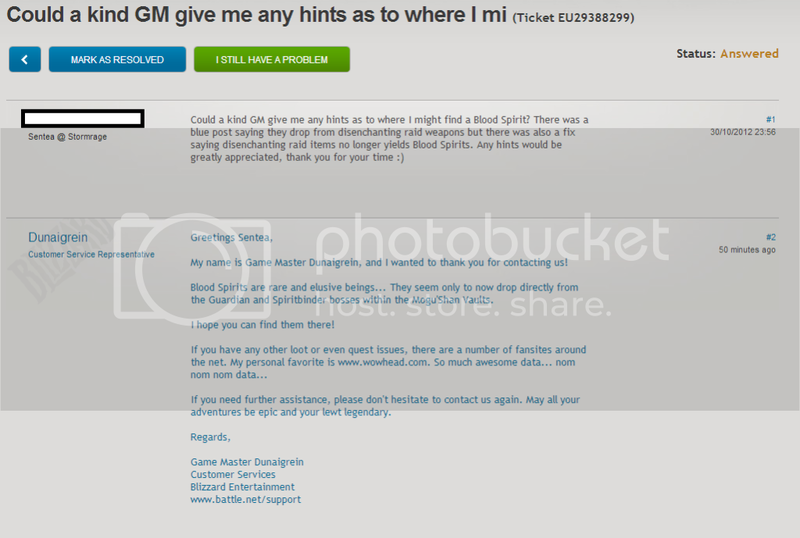 The conversation always goes something along the lines of "Blood Spirit need? How many" and I will say 200 or so, and he goes "buy 300 and won't come back for while" at which point I agree and he says "kk give me 20min"
What exactly do you deniers suggest he is doing in this 20 minute window? Open your eyes people. The ignorant blind defense of duplication is very strong here. Blizzard isn't stupid. They know that confirming duped items happens regularly, there would be huge uproar and bad PR for "allowing this to happen." I have bought about 1500x of these over the past couple months. I have a special "arrangement" with a contact on my server. He always sells me 200-400 at a time, and often "promises" to not sell them again on this server for several days. I have maintained a semi-monopoly on both Alliance and Horde auction houses. There's a couple other bulk sellers out there, but it's paid off very nicely for me. The conversation always goes something along the lines of "Blood Spirit need? How many" and I will say 300 or so, and he goes "buy 400 and won't come back for while" at which point I agree and he says "kk give me 20min"
What exactly do you deniers suggest he is doing in this 20 minute window? Open your eyes people. The ignorant blind defense of duplication is very strong here. Blizzard isn't stupid. They know that confirming duped items happens regularly, there would be huge uproar and bad PR for "allowing this to happen." Believe whatever you want. I suppose I can't blame you especially if you didn't play Diablo 2 in it's prime. It dropped off Galleon for me in a Marauder's Gleaming Sack of Gold. In Patch 5.2 those are sold by the Sunreaver Onslaught quartermaster, 400 valor each. As of 5.2 these have a chance to be inside LFR bags. Many ppl say it can be obtained by DE, but I got 1 from Amber Encased Treasure Pouch from the last boss, was right in the bag with my gold. Does anyone know (through the PTR I guess since LFR isn't open yet) if these are now available through DEing ToT LFR gear? Since the new tier of craftable items requires a new rare reagent, and since at 400 valour each 496 gear costs either 2400 or 3200 valor, it would make sense. I got one yesterday from a chest in the final room of the Treasure scenario of Isle of Thunder. Interesting. I just received my first blood spirit on 3/15/2013. All those bags on gold with 3 toons and none till then. Would I be correct in assuming that I did not get any previously because I didn't have patterns that used them? (didn't get any patterns using them till recent patch). Are only toons with one of the crafting professions of Leatherworking, Blacksmithing, or Tailoring able to receive them? This certainly gives enchanters a leg up. Enchanters are the only ones that can disenchant BOP items from LFR. LFR used to give a disenchant option when an enchanter was in the LFR group. Now, here's the question, where do the recipes drop? I just found one in a loot bag that dropped from Tsulong in Terrace. first comment should always be what the heck the item is. I have gone through all and still have no idea what I have. seems to drop from out door raid bosses or alteast sha of anger like it did for me. Дух крови is used to create item level 496 PvE Gear. They can be obtained through LFR satchels and disenchanting. They can be bought from the Kirin Tor Offensive and Sunreaver Onslaught quartermasters. I just found one of these in my inventory, and have *only* done LFR and world bosses since 5.4 hit. They must drop from something else than 10-man normals. Selling for 96 silver apiece on my server now. Lol. These used to be a fortune. wonder when haunting spirits will cost that much. Normal 116 and 120 Heroic does. "Если этот дух пробудить, он будет искать оружие, чтобы вселиться в него."